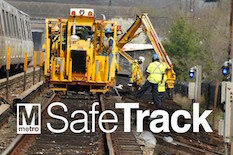 The University of Maryland’s National Transportation Center (NTC@Maryland) issued today its first of more than a dozen transportation impact reports and forecasts slated for release throughout the various phases of Washington Metropolitan Area Transit Authority’s (WMATA) SafeTrack, the accelerated track work plan for the Metrorail system. The first NTC@Maryland report indicates that, in response to the June 4-16 continuous single-tracking of the Orange and Silver Lines, Metrorail riders should continue to expect long delays and significant crowding on trains, particularly during peak travel hours. Drivers, however, should not expect to notice a difference in traffic conditions on the major roadways in Virginia nearest the location of WMATA’s first safety surge project. The report shows that from 6 a.m. until 9 p.m. on Monday, June 6, traffic volumes on I-66, I-395, and I-495 in the study area increased by just 3 percent in comparison to the previous eight Mondays in April and May 2016. While the morning peak period of traffic congestion measured on the upper bounds of congestion levels travelers had experienced on Mondays in the previous two months, this increase is still within the range of demand fluctuations typical for a Monday commute. The full report is available online at http://go.umd.edu/ntcreports. Analysis and Modeling: Using its integrated travel behavior and traffic simulator, which covers the entire Washington, D.C. metropolitan area, and the University of Maryland’s Center for Advanced Transportation Technology Laboratory’s (CATT Lab) Regional Integrated Transportation Information System (RITIS), NTC@Maryland will issue traffic trend maps and compare traffic patterns on area roadways during WMATA’s SafeTrack plan with average weekday traffic patterns. Opinion Polls: The center is conducting non-scientific opinion polls to observe how individual travelers will adjust their travel decisions in response to specific SafeTrack surges. Traffic Predictions: Using NTC@Maryland’s unique modeling system, UMD researchers will issue traffic and transit impact predictions for typical weekday traffic demand and conditions in those areas most directly affected by the active SafeTrack phase(s). NTC@Maryland was established in 2013 as one of five National Centers funded by the University Transportation Center Program of U.S. Department of Transportation. NTC@Maryland also benefits from support from several State Departments of Transportation, especially the Maryland State Highway Administration, and many local government and private-sector partners. Part of the Center for Advanced Transportation Technology (CATT), the CATT Lab houses the nation’s largest transportation database and supports national, state, and local efforts to solve transportation, safety, and security problems through the creation of software and systems for acquiring, analyzing, visualizing and communicating transportation data.